Judy Tammi at Frog Habitat Day. Photo credit: Peggy Plass. On Saturday, July 11, 2015, seven members of the Headwaters Master Naturalist group attended the Frog Habitat Day at Springdale Water Gardens in Greenville, VA. In spite of a rainy start to the day, HMN volunteers had a great time assisting at the event — talking with attendees about dragonflies and tadpoles, identifying plants, and searching for macroinvertebrates using a D-net in the stream. Visitors were able to participate in the hands-on events facilitated by the HMN volunteers at multiple stations throughout the grounds. Carol Heiser of the Department of Game and Inland Fisheries co-hosted the event along with Springdale Water Gardens proprietor Keith Folsom. Photos by Sandy Greene except as noted. Installing a home water feature is a great way to provide much needed habitat for frogs, salamanders and other aquatic wildlife, if you provide all the “right” ingredients these creatures need. Carol Heiser, Habitat Education Coordinator and Education Section Manager of the VA Department of Game and Inland Fisheries, will give a short presentation at Springdale about frogs and aquatic habitats, as part of the DGIF “Virginia is For Frogs” campaign (http://www.dgif.virginia.gov/wildlife/virginia-is-for-frogs/) Then Carol and Master Naturalist volunteers will take you on a walk around the grounds to point out habitat features and look for evidence of frogs and other aquatic species. The field experience will be followed by a demo of a new frog pond installation, with practical tips and other information about effective water features for wildlife habitat. We’re doing an abbreviated version of our Frog Pond Day since we had so much rain that day. 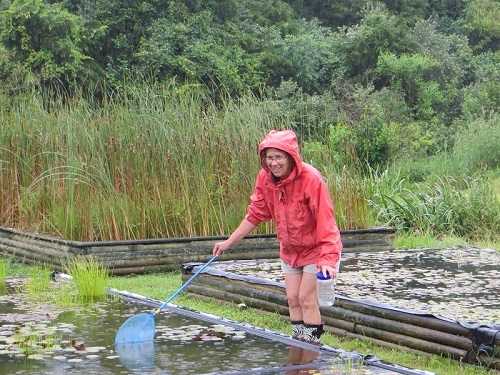 Enjoy a walk in the wetland habitat, looking for anything that we can stir up. Birds, flowers, reptiles, and amphibians live in this unique environment. We will look for whatever we can find. Bring shoes that can get wet. I’ll provide dip nets for this family-friendly exploration event. Come scoop around and learn about the water creatures and the importance of protecting our wetland habitat. After our wetland walk, we’ll go up to the gardens to see the frog pond, built specifically for native species. A short program on its construction shows you how easy it is to make your own. July 29, 2015 in Projects.